Can you remember the last time you spent your weekend doing something truly adventurous? When it comes to earning bragging rights and shoring up vacation envy, nobody does it better than Royal Caribbean. You’ll find plenty of opportunities to take your trip to the next level on a weekend cruise aboard one of their Royal Amplified ships — from intergalactic laser tag battles on deck to conquering the tallest waterslide in North America at the newly revamped private island, Perfect Day at CocoCay, debuting in May. Here are some pro-cruiser tips to help you make every moment of your weekend getaway count. Forget waiting in lines — Royal Caribbean makes it easy for you to jump right into the adventure with time-saving tools like online check-in for your cruise, which is available up until 72 hours before you set sail. And when you use online check-in, you get to board the ship faster and start your weekend adventure right away. If you’re cruising on Mariner of the Seas, you can even check-in right from your phone using the Royal Caribbean app. You can also arrange most activities online in advance using Cruise Planner. For your day at Perfect Day at CocoCay, pre-reserve a helium balloon ride to the highest vantage point in The Bahamas on Up, Up and Away, save your spot on the adrenaline-amping Zip Line, and pre-purchase passes to Thrill Waterpark, where you’ll find 13 different waterslides, including the tallest in all of North America. And if you’re looking to unwind, book a spa treatment at the exclusive Coco Beach Club (opening December 2019) or reserve a private cabana in the island’s other laid-back zones, like Oasis Lagoon and Chill Island. Your time onboard is sure to be just as thrilling as onshore. 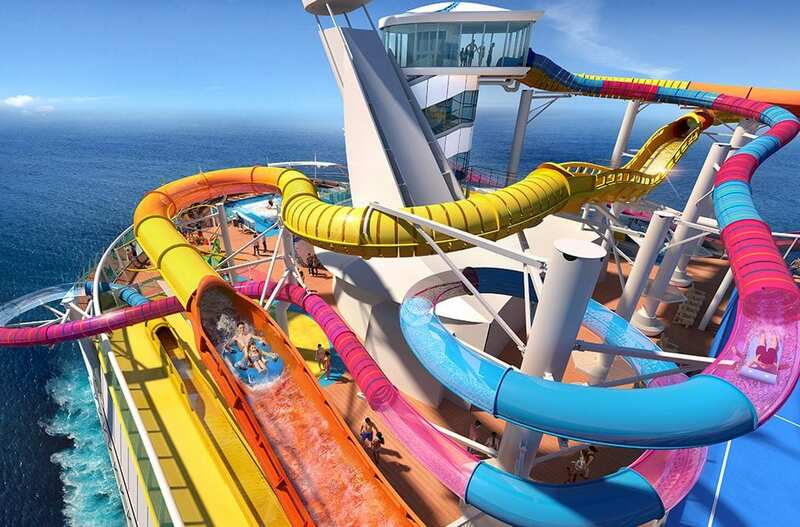 Both Mariner of the Seas and Navigator of the Seas have been newly Amplified with can’t-miss activities at every turn. On Mariner of the Seas, for instance, strap into the gigantic Sky Pad bungee trampoline for a literal leap into virtual reality. And take on the twists and turns of Cyclone and Typhoon — the duo that makes up The Perfect Storm waterslides. On Navigator of the Seas, The Perfect Storm packs even more punch with The Blaster, the longest stretch of slide ever suspended over water. That’s in addition to Riptide, the only headfirst mat racer on any ship. And for some friendly competition, head to Studio B on either ship for a glow-in-the-dark laser tag faceoff in the Battle for Planet Z. Nights onboard are just as exciting as the days. Head to The Bamboo Room for tiki-chic cocktails handcrafted with exotic fruits and spices. The whole family can score a good time at Playmakers Sports Bar & Arcade — catching your home team wins on the big screens while the kids celebrate their own victories over foosball and other classics. And for picturesque sunsets, there’s no better spot than the three-story island bar, The Lime and Coconut, exclusive to Navigator of the Seas. Ready to book that bucket list weekend adventure? No matter what your budget or time frame, you’ll find no shortage of affordable weekend sailings to choose from all year long. Navigator of the Seas offers three and four-night getaways from Miami, and Mariner of the Seas offers three and four-night getaways from Orlando. And February is the perfect time to book with big savings like 60% off the second guest’s fare, up to $100 to spend at sea — and kids sail free! What are you waiting for? Stop scrolling and get ready to Weekend Like You Mean It.